Trying to emulate those crazy "up-and-down wave" string parts turned out to be quite difficult, and I'm still trying to work out how to get a nice tremolo string sound in Ableton. 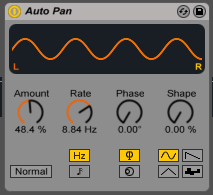 After watching a few tutorials, it seems like a common way to get a tremolo feel is to use an auto pan filter, set the Phase to zero making it a volume control without the pan effect, then adjust the Amount and the Rate to make it feel right. I did feel similarly to the Lord of the Rings pastiche in that I find it hard to do justice to fantastic composers' work like John Williams and Howard Shore, whose live orchestras just can't be mimicked authentically using MIDI. But it was still a great exercise to analyze Williams' work, and to prime myself for further challenge as I try to evoke certain styles in the future. In other news, I've found a fantastic female singer to help me with my final piece, a pastiche of the Firelink Shrine music from Dark Souls 3. So that is the plan for March, along with further refining the look and layout of the site, plus putting together the demo reel. I've been binging on episodes of Level With Emily Reese, my new favourite podcast. Its focus is vidoe game audio and music, almost every episode features a video game composer interview, which has been fantastic for me for learning their stories, advice, techniques, and creative processes. Through there I found another fantastic resource for video game composers: the online Video Game Music Academy started by Dan Hulsman. Well that's all for now! Thanks for reading and check back for updates on the Dark Souls 3 Firelink Shrine pastiche!